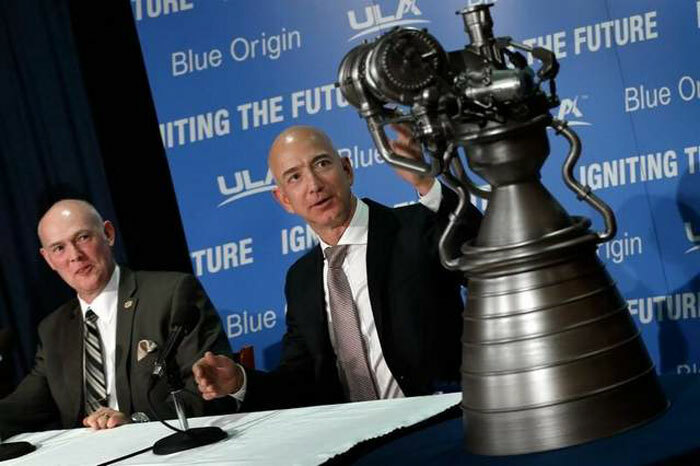 WASHINGTON — The United Launch Alliance (ULA) is teaming with Seattle-based Blue Origin to design and produce a next-generation, American-made rocket engine for space launch, the companies announced Wednesday. While the engine will be designed for multiple missions, the agreement is a clear move by ULA to develop an American-made replacement for the RD-180, used in its Atlas V vehicle for military space launch under the Air Force’s Evolved Expendable Launch Vehicle (EELV) program. The Russian-made RD-180 has become a source of controversy following that country’s invasion of Ukraine. Blue Origin has been a passion project for Jeff Bezos, best known as the founder of Amazon.com, and more recently as the new owner of the Washington Post. Its prime facility is located just outside of Seattle — close to a number of facilities operated by Boeing, which owns half of ULA in a partnership with Lockheed Martin. Bruno, who replaced long-time ULA head Michael Gass in August, heaped praise on Bezos as a true American success story. “I just have to say how honored I am to sit up here with Jeff Bezos, one of our country’s truly great innovators and entrepreneurs, a man who has really changed how things work,” Bruno said. It was hard not to miss the fact ULA now has its own silicon valley superstar on board to help counter the popularity of Elon Musk, the PayPal and Tesla Motors inventor whose SpaceX launch company has proven a thorn in ULA’s side. That will be particularly helpful when dealing with Congress, which has clearly taken a shine to SpaceX as an alternative to the legacy provider of military launch. But while Bruno said the team was already holding meetings with members of Congress on its new venture, he insisted the decision was driven by the technology Blue Origin could bring to the table. The engine in question is the Blue Engine 4 (BE-4), which Bezos said could provide 555,000 pounds of thrust, operating with liquefied natural gas. In the future, the engine also has the potential to be reusable, although that won’t occur for EELV purposes, Bezos told reporters. Both men stressed that the Blue Origin team has been working on the engine for three years, which should reduce needed development time. Analysts have estimated that developing a new engine from scratch could take anywhere from five to seven years and cost $1 billion. ULA is making a “significant” investment in Blue Origin, Bezos said, but declined to say how much money the launch company was funneling to its new partner. The engines will be adapted for the Atlas V and Delta IV, ULA’s existing launch vehicles. That will require some re-engineering on the vehicles to adjust for the differences in size and weight of the new stage-one rocket engines. ULA engineers are studying that issue and expect to make their decisions public by the end of the year, Bruno said. Bruno confirmed that the relationship came out of a series of study contracts ULA announced in June. The ULA event was held at the National Press Club in downtown Washington. As Bezos and Bruno finished speaking, the Air Force’s head of Space Command, Gen. John Hyten, discussed the announcement with reporters at the Air Force Association’s Air and Space conference, being held just outside the city. Hyten said he was “excited” about the partnership, according to news reports. Both Bezos and Bruno said they had contacted the Air Force and received positive feedback about the new agreement. Centennial, Colo. and Kent, Wash. – Sept. 17, 2014 – United Launch Alliance (ULA), the nation’s premier space launch company, and Blue Origin, LLC, a privately-funded aerospace company owned by Amazon.com founder Jeff Bezos, announced today that they have entered into an agreement to jointly fund development of the new BE-4 rocket engine by Blue Origin. This new collaboration will allow ULA to maintain the heritage, success and reliability of its rocket families – Atlas and Delta – while addressing the long-term need for a new domestic engine. The ULA/Blue Origin agreement allows for a four-year development process with full-scale testing in 2016 and first flight in 2019. The BE-4 will be available for use by ULA and Blue Origin for both companies’ next generation launch systems. The BE-4 is a liquid oxygen, liquefied natural gas (LNG) rocket engine that delivers 550,000-lbf of thrust at sea level. Two BE-4s will power each ULA booster, providing 1,100,000-lbf thrust at liftoff. ULA is investing in the engineering and development of the BE-4 to enable availability for national security, civil, human and commercial missions. Development of the BE-4 engine has been underway for three years and testing of BE-4 components is ongoing at Blue Origin’s test facilities in West Texas. Blue Origin recently commissioned a new large test facility for the BE-4 to support full engine testing. With more than a century of combined heritage, United Launch Alliance is the nation’s most experienced and reliable launch service provider. ULA has successfully delivered more than 80 satellites to orbit that provide critical capabilities for troops in the field, aid meteorologists in tracking severe weather, enable personal device-based GPS navigation and unlock the mysteries of our solar system. Bringing rocket science down to Earth.